Almost 2 months ago, Anthony and I traveled to Orlando, FL for our company’s “Grand Meetup”. We had a blast! See, the company we work for is distributed meaning we don’t work from one office but rather from home, coffee shops, coworking offices, or even from the road for those who are nomadic. To balance things out, for 1 week a year we all get together to hang out, learn, and work. We left RIC Saturday morning (but not that early). Anthony ended up on later flights than me because there was an issue with his last name change in the system we use to book flights. But no worries, he only arrived in Orlando an hour later than I did. So I was able to check into our room, claim my bed, unpack a bit, then met him in the lobby of the hotel. After we were all settled in, we joined fellow coworkers downstairs for the unofficial pre-welcome party hangout. We had some snacks at the hotel bar, caught up with a few friends that had already come in, then went back to the room to freshen up. We came back down a little bit later for registration and the welcome party at the pool! Registration included super fancy pens with our names engraved on them, our name tags, conversation-starter pins (to put on our lanyards), and other various swag. Outside, the welcome party had tons of food with several stations surrounding the pool. My favorite was the cheesy pasta of course, but the sorbet for desert was really delicious as well. As usual there was an open bar (this continued throughout the whole week), but Anthony and I didn’t partake as we’re not really into drinking. I like the occasional glass of wine but I also prefer to eat my calories rather than drink them. Our first Grand Meetup photo together! We called it a night around 10:30 but really we just went back to our room and watched TV. On Sunday, we spent the day with our respective teams. My team name is Athens and we’re self-described as the “grackles”. We spent almost the whole time together on our AMA (Ask Me Anything) for our newest team members. It took a few hours as we all seem to like to talk about ourselves – this is a good thing! I had a great time learning about my closest coworkers. Even though I’ve known a some of these awesome people for a few years now, I still learned some new tidbits and had a great time. After lunch, all of Automattic Support (WordPress.com, WooCommerce, and JPOP) got together for a Happiness Happy Hour. It was a small mixer where we shared in-person Kudos (like a “good job” or “you did this amazing thing” notes), had drinks, picked up patches, and more. By patches, I mean these 2″ round iron-on patches we have representing our teams and projects. I manage the patches for all the WordPress.com teams and projects, but also brought with me the WooCommerce patches to the GM – so about 1/4 of my suitcase was filled with these “little” things! Straight from the Happiness Hour, we headed outside to join the rest of the company for our company photo! Can you find Anthony and I? 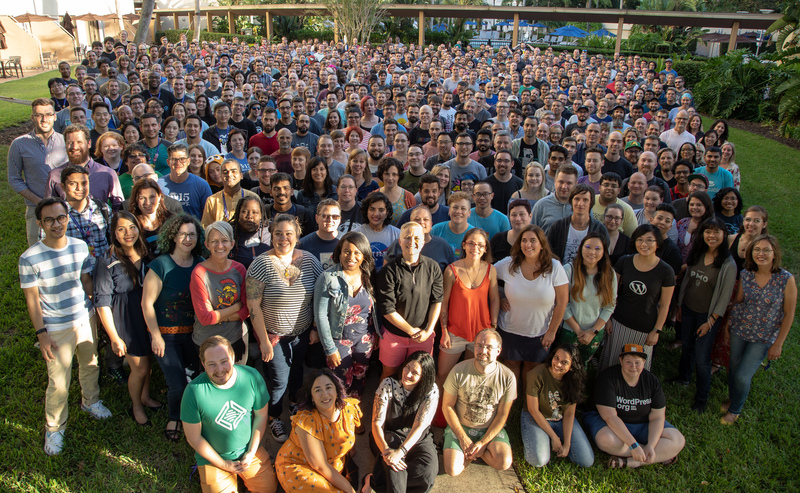 I have to say this year the setup for the company photo was much quicker, but I think we’d benefit from a wider stance. The people in the front are quite huge while people in the back are beyond tiny. Guess that happens with so many employees! We had the rest of the evening to relax on our own, so Anthony and I chose to hit up Game Night of course. Maureen, a fellow board game enthusiast and Temporary Leader of (Team) Earth, brought the game Azul and we gave that a try – LOVE IT. In fact, we got home and almost right away purchased it. The tiles are very pretty, and the game is pretty easy to get the hang of so you can get right to strategizing. We didn’t stay up too late, just played a few games then went back to our room to hit the hay. Monday morning started with breakfast accompanied by a keynote – Cheryl Strayed, author of Wild, Tiny Beautiful Things, and more. I really enjoyed her talk, she covered a lot of ground and gave me a lot to think about. After breakfast it was time for everyone to get to work. Each Automattican chose before the GM whether we’d like to do our normal work (assisting users), collaborate on projects, or take a class. I opted to take the Engineering CSS class taught by Kathryn Presner, Julia Sydnor, and Kristen Symonds. I already felt pretty comfortable with CSS already but wanted to get back to the basics to make sure I’m doing things properly, then expand my knowledge. On our first day in class we started from just about the beginning; it was a long day but I learned quite a bit! The bulk of this day was spent working – I was back in the CSS class I had chosen. I learned a lot and managed to sneak a few photos of our wonderful instructors. During one of the breaks I bumped into this guy out in the hallway. He was also on break from his class (Using Data at Automattic), so we enjoyed our snack time together. It was like we were back in high school… sorta! After a long day of working hard, it was time to unwind as a company. NERD ALERT, Automattic rented out Diagon Alley at the Wizarding World of Harry Potter!!! Yes, I bought a Hermione quote shirt specifically for this occasion. I also wore my gold snake necklace! Anthony and I are pretty huge Harry Potter fans and had already been to the park in LA during our 1st anniversary trip, so it was a huge treat to get to go again in Orlando with all of our coworkers. As soon as we got the park, we headed right for the Harry Potter and the Escape from Gringotts™ ride. We assumed (correctly) that since we were on the first bus, if we hit up this ride before everyone else arrived and before we ate dinner, the line would be nonexistent. It was glorious. We basically ran through all of the rooms where lines usually congregate. Soon enough we were on the ride (Anthony didn’t come on the ride, he hung onto my purse) and ready to go! It was loads of fun. Just one big drop and then a lot of cool 3D graphics, some water, some heat, etc. After the ride we headed to the party where there was tons of food, Butterbeer, great music, and entertainment. Unlimited supply of free (to me) BUTTERBEER… heck yes! I had 2-3, I can’t remember (they are non-alcoholic and normally $7 a piece or something). After eating and hanging out for a bit, we took the rid over to Hogsmeade on the Hogwarts Express (the train for you Muggles). We bumped into Marj, a fellow coworker from Dallas and took the train over with her and a few other coworkers. When we got to the other side, we had to head right back as we didn’t have tickets to the other park as well (shame on Automattic for not renting BOTH parks…). But it was still a super fun experience. According to Universal, the interactive wands use a special technology to cast magical “spells”, so you can walk around the park and make magic happen. It’s really fun to do, even though we’re all (barely) adults. We shared our wands with coworkers so they could get a taste of the magic too. Seriously it’s too much fun to keep to yourself! I didn’t take any video of us performing magic, but here’s a great video I found on YouTube of it all. After a bit of magical fun, I wandered off with a few of my teammates to the Men In Black ride. Anthony’s not a huge fan of rides so he stuck around in Diagon Alley. The ride I went on was pretty docile, it just spun us around a bunch and we shot at aliens throughout. When I got back, we took one more lap around Diagon Alley and then headed back to the charter busses to take us back to the hotel. This morning it was back to class – our last day already! We learned a lot more about some more advanced CSS and then called it a day… but wait there’s more! I stuck around after class for a sort of “Intro to Child Themes” class and learned how to create a child them (I already had an idea but had never bothered with it much). That was really informative and learning a little bit of PHP was really fun. Maybe I’ll try and learn more PHP one day. Later this day Anthony and I decided to skip the offered dinner and head into Disney Springs for some Blaze pizza! We were all salivating just at the thought of having a bit more normal-to-us food for a change (the food at the GM was great but not my normal diet at least). We had a nice walk around Disney Springs in the dark and then headed back to the hotel. This night there were a bunch of random activities going on: vintage gaming night, board games, karaoke, open mic, and so much more. I checked out a few of these activities but we eventually settled upon… you guessed it board games. Enjoyed a few 90s candies with my teammates, such as these candy cigarettes while at vintage gaming night. This morning started off pretty chill. There were a few keynote speakers but we used this time to catch up on a bit of sleep. Anthony was pretty sick by this point in the trip so he needed the extra rest! Then it was time for the infamous CEO Townhall with Matt Mullenweg! This is the only photo I took with my drink of choice (orange juice with ginger ale) in hand we made it through a few hours of the townhall. I normally stay through the entire event, but my team decided to take detour into Disney Springs for one hast hoorah – desert at Ghirardelli. Being mindful of my diet, I enjoyed a small hot cocoa, but as you can see I’m not the only Athenian with a sweet tooth! Upon arriving back at the hotel, Anthony and I checked out the Silent Disco and it did not disappoint. I’ve never experienced one – but it was a blast! If you’re not familiar with the concept of a Silent Disco, here’s a quick rundown: You get headphones as you walk in and turn them on. In this case we had 3 stations to choose from – green, red, or blue. Each station had it’s own DJ (fellow Automatticians that rotated throughout the night) and you could switch stations at any time if you wanted. The idea is that outside of those headphones the scene is… well… silent. As you can hear in this video, that’s not entirely the case, haha! After a good while of dancing and popping back and forth between the (still ongoing) CEO Townhall and the Silent Disco, we headed to our room to retire for the night. Mid-day a few friends (Sarah Wolf Milligan & Megan Gorski Albritton) and I went into Disney Springs one last time. We enjoyed some cupcakes and did a bit of window shopping. After a bit of walking around we headed back to the hotel to freshen up for the closing party. Oh, and Megan stopped by my room to French brand my hair! She’s basically a pro as she has two daughters (I like to think I was a little more cooperative haha). Before heading to the closing party, my team wanted to get together one last time so we had a little dip in the pool and hot tub outside at the hotel. Then it was time to really get ready for the closing party! It’s hard to describe just how amazing the closing party was. Automattic rented out an event space at Epcot’s World Showcase, we were somewhere near the Canadian restaurants and attractions. The place was decorated so beautifully and the food was delicious! As always there was a photo booth with props. We had a great time playing around with that. There were games to play – air hockey, pinball, foosball, etc.! I’ll note here that at one point Anthony hit the air hockey puck and it flew threw the air and landed in a coworkers back pocket. I also almost got hit by the puck right in my eye, it was maybe an inch away. So that was interesting. And of course amazing live music provided by our own coworkers. After a good while of enjoying ourselves here, we all traveled outside where we were guided to a private viewing area for the nightly fireworks show (and delicious deserts)! That was such a treat. I managed to get some of the firework show on video, but as soon as it really got started I put my phone away so I could really enjoy the show. After the firework show we decided to head right back to the hotel as we had an early flight in the morning. So we said our goodbyes, got on the shuttle, got back to our hotel, and passed right out. In the past I’d planned my departure time for later in the day so as to avoid having to wake up too early with all the shuttles and such, but this time we had somewhere to be! Anthony and I were heading from Orlando to Dallas instead of home.